Thorium fluoride, ThF4 provides the lowest absorption at 10.6µm wavelength and has been the mainstay for high energy applications where high damage thresholds are required. Because thorium fluoride is a naturally radioactive material and special handling and disposal procedures must be followed, continuing searches are underway for alternate, non-radioactive substitutes. 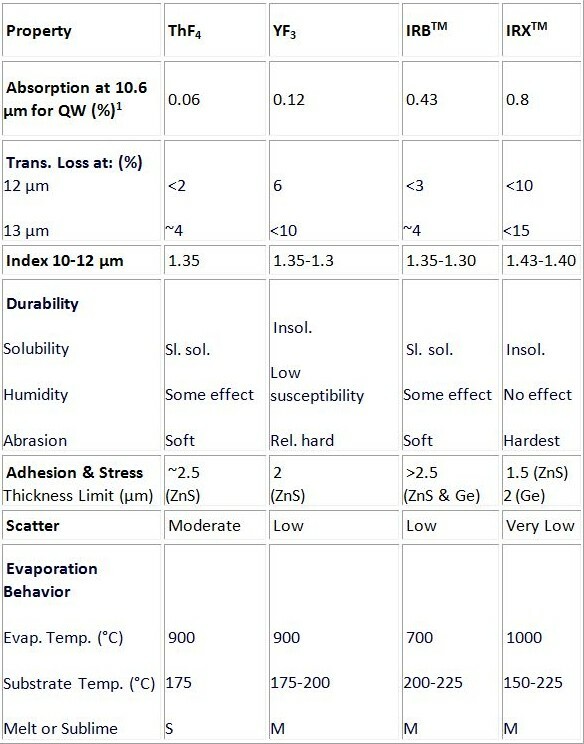 Many applications do not require the lowest possible absorption. Consequently, other fluorine compounds may be useful in certain areas. The accompanying table lists three alternate choices: yttrium fluoride, Materion's IRB and IRX. 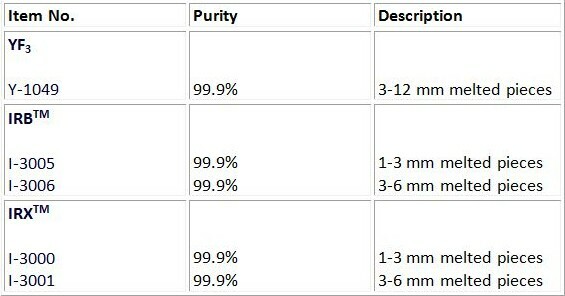 Aside from low absorption, these fluorides have sufficiently low refractive indices to satisfy that requirement in high efficiency anti-reflection coatings. All of the suggested fluoride compounds can be evaporated by resistance-heating or e-beam techniques. Each of these materials should be preconditioned for several minutes at low power until pressure changes and spitting subsides. Of the three compounds listed, only thorium fluoride sublimes. The others melt. Thorium Fluoride, ThF4 is naturally radioactive and must be handled in accordance with established regulations. YF3, IRBTM and IRXTM can all be handled with no special precautions, except the usual concern for dust inhalation. Thorium Fluoride, ThF4 is available in various qualities and particle sizes, depending upon the application. Please contact us via the Materion contact us form for application assistance or for other technical concerns regarding the use of these fluorine coating materials. Materion manufactures one of the world's largest selections of coating materials and can produce nearly any desired non-standard coating material. Numerous materials for evaporation as well as sputtering targets of various compositions can be found on the Materion on-line catalog . If you require a custom manufactured item, please CONTACT US. Click to view more information about Materion thorium compounds. Absolute absorption determined calorimetrically by D. Fisher and R. Compton at Coherent Auburn Group. IRBTM and IRXTM are Trademarks of Materion.